Carpeting adds comfort, dimension, texture, and color to any space, and taking good care of it is well worth the effort. 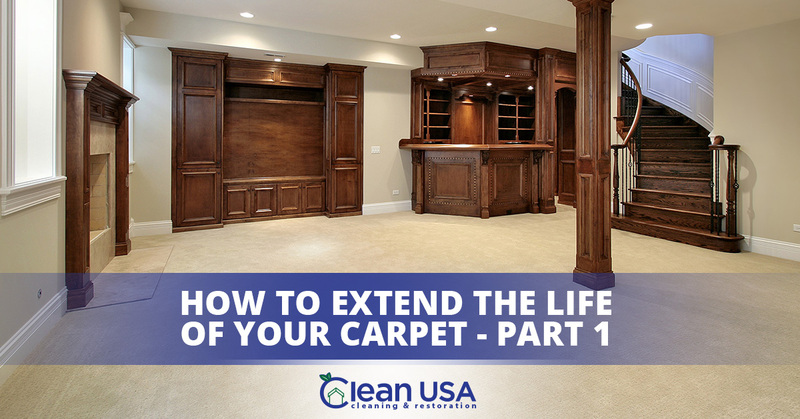 Carpet care becomes even more compelling when you realize how much it can cost to replace it. At Clean USA, we work hard to make our clients’ carpets last as long as possible. Here are some tips that may come in handy for you! We’ve all vacuumed an old carpet and been disappointed with the results. The fact is, there are many factors that play into a carpet’s wellbeing, and age is only one of them. Density, weight, texture, twist, material, and pile also play significant roles. For instance, if your carpet is made of polyester, it will probably need to be vacuumed and deep-cleaned more often whereas nylon carpet can go longer without wearing down. Carpets with long pile tend to suffer more damage, dirt, and crushing, whereas carpets with short, dense pile can stand up to a lot more wear and tear. Vacuum height. Set your vacuum too high, and it won’t do its job. Put it too low, and the vacuum can damage the carpet as well as the vacuum. You’ll know your vacuum is at the correct height when it can just barely pull itself along. Vacuum bag/filter. A vacuum with a full bag or clogged filter won’t be able to function correctly. Check the bag before you vacuum and change it when it gets close to full. If your vacuum has a filter, put in the effort to keep it clean, and your vacuum will do a better job. Vacuuming technique. A lot of people vacuum quickly, running the unit back and forth at a rapid pace. Unfortunately, this means that many carpets aren’t actually getting clean. Vacuums are designed to clean a specific pace, and if you’re rushing, you won’t get good results. Go slower than you think you should, and when you get to high-traffic areas, go even slower. Additionally, consider making multiple passes. Studies show that, if you vacuum at the perfect pace, the average vacuum will pick up only 75 percent of the surface dirt. If you want to get the rest of the dirt, you’ll have to make more passes and remember: we’re just talking surface dirt, not the rest of the contaminants deep within the rug. Hot water extraction is the only solution to deep dirt. Have you ever moved a bed or couch and realized there’s basically a trench in the carpet where everyone’s feet have been? Have you seen carpeted hallways where the edge of the carpet looks completely different from the main walkway? You’re seeing the effects of heavy traffic, effects that can be mitigated with specialized rugs. 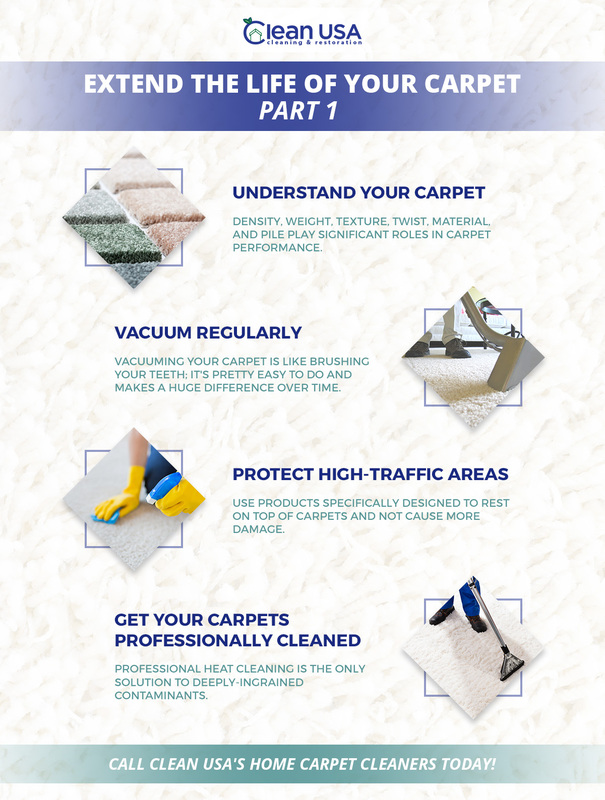 While you may be against the aesthetic of rugs on top of carpet or you don’t want a plastic mat in your living room, these solutions can make a big difference for carpet. Believe it or not, there are products specifically designed to rest on top of carpets and not crush them or cause more damage. When it comes to making carpets as clean as possible, there’s no better team than Clean USA. Our home carpet cleaners use proven and cutting-edge equipment and techniques to give your carpet the care it needs. Contact us in Sycamore today!